Manufacturing and sales of Golf clubs. Manufacturing and sales of Golf qtuipment. The Birth of "Made in Japan , SAKATA". 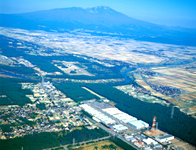 In the suburbs of Sakata in Yamagata prefecture, on a 500,000 square meters site spread out in the foothills of Chokai Mountain is HONMA GOLF's Sakata Plant. All the HONMA "Made in JAPAN , Sakata" clubs are produced here. While this is one of the largest plants of it’s kind in the world, we believe that the word “Studio”is more fitting than the word “Factory”. Our clubs are carefully handmade one-by-one by our staff of more than 400 skilled craftsmen over a number of different processes. No corners are cut or any job rushed to make our products. The beginnings of producing all HONMA clubs lie in this Sakata Plant. Homma brothers opened a driving range in Tsurumi Yokohama. Tsurumi Golf Center Co. (fore-runner of company) established. 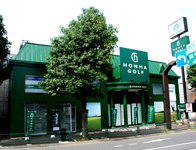 Honma Golf Club Manufacturing Co. established in Tsurumi. First carbon graphite "Black" shaft-installed woods marketed. Work started on 5th stage of Sakata factory. 5th and 6th stages to be started before September 1990. Honma Co., Ltd. re-registered as present Honma Golf Co., Ltd.
Granted U.S. patent for titanium reinforced carbon shafts. 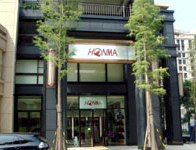 Honma Golf West Japan Sales Co., Ltd. (agent in charge of whole Kyushu district) incorporated to Honma Golf Co.,Ltd. HONMA GOLF SINGAPORE PTE LTD opened. Assets and business of H.G.C.CO.,Ltd. (Aso Takamori Golf Club) purchased. The shares of HONG KONG HONMA GOLF CO.,LIMITED , HONMA GOLF SDN.BHD. and HONMA GOLF (THAILAND) CO., LTD. were transferred to HONMA GOLF SINGAPORE PTE LTD. The shares of TAIWAN HONMA GOLF CO., LTD. were transferred to HONMA GOLF SINGAPORE PTE LTD.